bureaucracy’s ill-defined relations with political leaders. The timing of publishing the book could not have been any better as many Andhra bureaucrats are now peeved at investigating agencies “targeting” babus while “virtually sparing” their political masters. Also, the IAS officers of the state and even of outside have been highly disturbed by the provocative remarks reportedly made by minor irrigation minister of the state TG Venkatesh. The minister reportedly asked people to “shoot IAS officers who don’t perform” forcing top bureaucrats in the state formally lodging complaints with the chief minister. 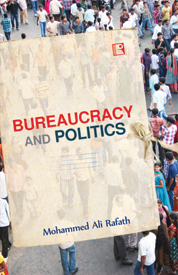 Rafath, who is currently the head of AP Dairy Development Cooperative Federation, has compared political influence and other aspects of Indian bureaucracy with those of other geographies such as UK, Japan etc. He also gave the examples of political pressure on civil servants during emergency of 1975 and Gujarat episode of 2002. Is there a way out? Rafath has penned a model legislation defining the relations between political leaders and civil servants. Will the Union department of administrative reforms and public grievances look at Rafath’s prescriptions? a) Mohd Shahid, a 1998 batch Gujarat cadre IAS, has been appointed as private secretary to minister of state for agriculture and food processing industries Harish Rawat at a director level. b) JA Vaidyanathan, a Central Secretariat Service officer has been appointed as director in department of personnel and training (DoPT).